Provide comfort for the family of Anna Neufeld with a meaningful gesture of sympathy. Mrs. Anna Neufeld passed away at the Red Deer Regional Hospital Centre on Sunday, April 7, 2019 at the age of 96 years. Arrangements in care of Parkland Funeral Home and Crematorium, 6287 – 67 A Street (Taylor Drive), Red Deer. 403.340.4040. 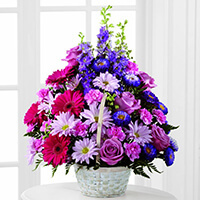 To send flowers in memory of Anna Neufeld (Peters), please visit our Heartfelt Sympathies Store. Lorraine Oakes sent flowers to the family of Anna Neufeld (Peters). Remembering Anna with prayers, beautiful memories and a heart full of love for you all! Very sincerely, Lorraine. Lorraine Oakes purchased the The FTD Pastel Peace Basket for the family of Anna Neufeld.